The research findings reported here were obtained from a literature review performed by Alison Eagle of Duke University (Nicholas Institute for Environmental Policy Solutions) in April 2016 under contract to the Environmental Defense Fund. Thiosulfate (S2O32–) fertilizers are a liquid sulfur additive than can be combined with various other fertilizer sources to satisfy plant nutrient requirements. While many fluid thiosulfate fertilizers are available, ammonium thiosulfate (ATS) is the most widely used fluid fertilizer that contains sulfur; it is composed of sulfur dioxide, elemental sulfur, and aqueous ammonia. Product examples include Kugler ATS and Thio-Sul®. Typically, ATS is mixed with urea ammonium nitrate (UAN) to produce a 28-0-0-5 fertilizer. Once applied, ATS reacts to form a byproduct (tetrathionate) that is eventually converted into sulfate, which is then available for plant uptake. In some cases, improved nitrogen (N) efficiency can be achieved simply by removal of the sulfur deficiency — i.e., if sulfur is no longer a limiting factor, the crop can better utilize N. Bands of ATS have also been shown to increase the solubility of some other micronutrients (International Plant Nutrition Institute n.d.). ATS also seems to directly improve nitrogen fertilizer use efficiency and reduce the rate of nitrogen loss, and is advertised as such. The main mechanism is by slowing the rate of urea hydrolysis and thus reducing ammonia volatilization. This is mostly likely caused by the presence of the tetrathionate as ATS reacts and converts to sulfate. Prior to the identification of ATS, researchers found that other reduced sulfur compounds inhibited urea hydrolysis and nitrification. Thiourea inhibited urease and nitrification in early laboratory studies, and thioacetamide, phosphorus penta-sulfide, and calcium sulfide also inhibited urea hydrolysis (Malhi and Nyborg 1979). Later lab studies found that even low rates of ATS applied with UAN reduced urea hydrolysis and ammonium oxidation rates (Goos 1985). Early field microplot studies from North Dakota showed that ATS reduced ammonia losses when applied with UAN on a bare soil surface and wheat stubble, with the greatest reduction being from dribble application compared to sprayed (Fairlie and Goos 1986). 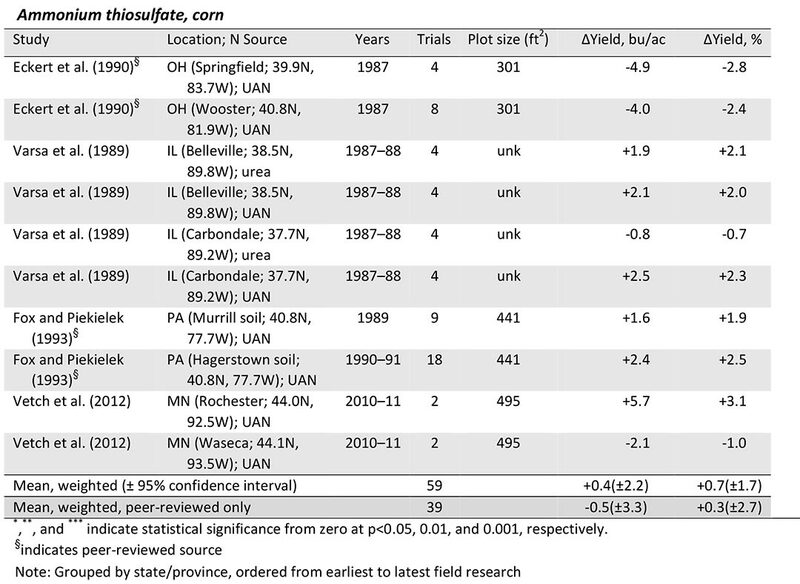 For no-till corn in Pennsylvania, corn yield, ear-leaf N, and total N uptake increased with broadcast UAN+ATS compared to UAN alone (Fox and Piekielek 1987). ATS may also reduce nitrification-related N loss, as it oxidizes into sulfuric acid and produces slight soil acidification in the application zone. ATS can be applied through various irrigation systems, but it is not recommended as a foliar spray due to potential crop damage (International Plant Nutrition Institute n.d.). A search of the scientific literature and grey literature (conference proceedings etc.) was conducted to locate data on crop yield responses to ammonium thiosulfate. Data were incorporated into an existing database on fertilizer management field trials, including all available management, climate, soil, N loss, and crop productivity information. The following tables and discussion summarize the yield impacts of ammonium thiosulfate. Weighted averages are calculated where possible, with results from each study weighted by the inverse of the number of trials in each location. This prevents studies from very well-studied locations from overwhelming the average results. Overall effect sizes are reported for all studies, with effect sizes also restricted to peer-reviewed data, as applicable. 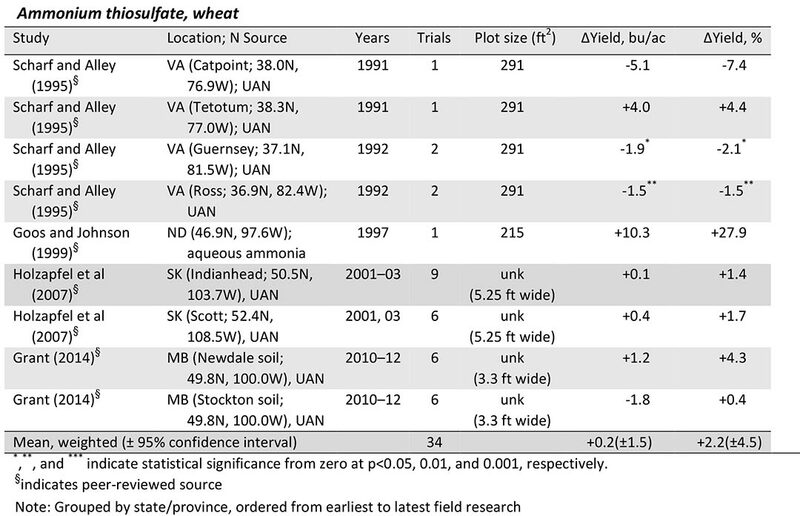 As can be seen in the above tables, ATS did not have any significant yield impact in most individual research studies for both wheat and corn. Overall weighted averages were also not significantly different from zero. Results from peer-reviewed and grey literature were comparable with one another. Therefore, in the conditions studied, any cost of the product would not be covered by additional crop yield, and is thus unlikely to be of value to a grower. Only one study reported crop N uptake, so it is not possible to directly determine the effect on nitrogen use efficiency. No data were available on N losses as nitrous oxide or nitrate. With the data available, and in the conditions studied, ATS failed to improve crop yield in wheat and in corn. However, since research has confirmed some potential to reduce N losses by improving sulfur and micronutrient nutrition, and by inhibiting both urease activity and nitrification, results may differ in other situations. For example, if N or S were limiting growth, ATS might have a positive yield effect. But, more data are needed before basing any programs or key decisions on this. In addition, lack of data make it impossible to determine whether there are other responses in terms of nitrogen dynamics (e.g., N losses or plant N uptake). In conclusion, unless further research proves otherwise, ATS is not likely to be highly recommended as a product for improving N use efficiency. Eckert, D.J., A.M. Chech and V.L. Martin. 1990. Ammonium thiosulfate and ammonium-sulfate effects on corn performance and inorganic soil-nitrogen. Journal of Fertilizer Issues 7(2):24–30. Fairlie, T.E. and R.J. Goos. 1986. Urea hydrolysis and ammonia volatilization characteristics of liquid fertilizer mixtures. 2. Studies under modified field conditions. Journal of Fertilizer Issues 3(3):86–90. Fox, R.H. and W.P. Piekielek. 1987. Comparison of surface application methods of nitrogen solution to no-till corn (Zea mays L.). Journal of Fertilizer Issues 4:7–12. Fox, R.H. and W.P. Piekielek. 1993. Management and urease inhibitor effects on nitrogen use efficiency in no-till corn. Journal of Production Agriculture 6(2):195–200. Goos, R.J. 1985. Identification of ammonium thiosulfate as a nitrification and urease inhibitor. Soil Science Society of America Journal 49(1):232–35. Goos, R.J. and B.E. Johnson. 1999. Performance of two nitrification inhibitors over a winter with exceptionally heavy snowfall. Agronomy Journal 91(6):1046–49. Grant, C.A. 2014. Use of NBPT and ammonium thiosulphate as urease inhibitors with varying surface placement of urea and urea ammonium nitrate in production of hard red spring wheat under reduced tillage management. Canadian Journal of Plant Science 94(2):329–35. Holzapfel, C.B., G.R. Lafond, S.A. Brandt, W.E. May and A.M. Johnston. 2007. In-soil banded versus post-seeding liquid nitrogen applications in no-till spring wheat and canola. Canadian Journal of Plant Science 87(2):223–32. International Plant Nutrition Institute. n.d. Thiosulfate – Nutrient Souce Specifics, No. 8. IPNI, Norcross, GA. http://www.ipni.net/specifics-en (verified 20 March 2016). Malhi, S.S. and M. Nyborg. 1979. Rate of hydrolysis of urea as influenced by thiourea and pellet size. Plant and Soil 51(2):177–86. Scharf, P.C. and M.M. Alley. 1995. Nitrogen loss inhibitors evaluated for humid-region wheat production. Journal of Production Agriculture 8(2):269–75. Varsa, E.C., A.K. Leis, and J.M. Jemison Jr. 1989. Response of no-till corn to urease inhibitors and placement of N sources. Proceedings of the 19th North Central Extension-Industry Soil Fertility Conference 5:1–10. Vetsch, J., D.E. Kaiser and G.W. Randall. 2012. Continuous corn production as affected by starter fertilizers containing nitrogen, phosphorus, and sulfur 42nd North Central Extension-Industry Soil Fertility Conference 28.